This week, we are featuring Comics from the Edge on Monday, Thursday, and Friday. The reason for this was to have Wednesday be the day to celebrate the completion of our graphic novel, Dr Death vs The Zombie. Moving on! Have you figured out what's going on in this comic? We have Manfred Von Richthofen (aka The Red Baron) explaining to another officer how he was shot down. So who was the culprit? Some "doggy on a teeny-weeny house." That's right, it was Snoopy. I pitched this concept to Bob Toben and he liked my Red Baron idea. It was my son who inspired me. My wife took my son and daughter to the library a few weeks ago, and he picked out the 1966 classic, It's The Great Pumpkin, Charlie Brown on DVD. We know the story about Linus waiting in the field with Sally to see the Great Pumpkin. We also have Charlie Brown going trick-or-treating only to receive a bunch of rocks. Poor kid. But this show also features a brief story where Snoopy battles The Red Baron. I've always been a Peanuts fan. Charles Schultz created a great comic and the humor is timeless in my opinion. 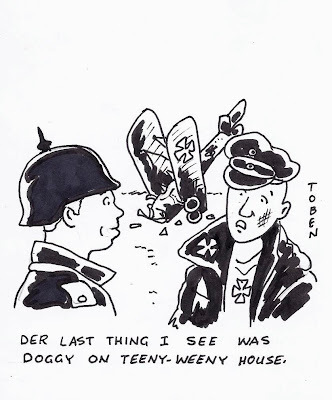 I've always enjoyed Snoopy's battles with the Red Baron, but to my knowledge, we never see the Red Baron. I thought it would be neat to see things from the Red Baron's perspective. Enjoy! Want to read more Comics from the Edge? Click below for more fun.